Women are in for a unique and memorable reading experience, where classic meets contemporary, with The Comfort of God&#8217;s Love. In this brand-new devotional&#8212;inspired by the writings of Hannah Whitall Smith&#8212;dozens of contemporary devotions offer refreshing reminders of God&#8217;s many promises of comfort, help, and love. 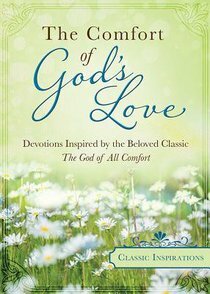 About "Classic Inspiration: The Comfort of God's Love"
Marcia Ford is a former religion editor for The Ashbury Park Press, associate editor of Charisma magazine, and editor of Christian Retailing. But she describes herself as mostly, I'm a book author, with 18 traditionally published books. I'm also a ghostwriter, though of course I can't talk specifically about those books; let's just say that I've ghostwritten or contributed to 12 additional books. I'm also a book editor, book reviewer, writing instructor, writing mentor, and journalist. I'm married with two adult daughters, and I have a special interest in postmodern spirituality.